Be of stout heart, comrade conservatives, for while things continue to go badly for good sense in government, the media and corporate boardrooms, there is a victory of sorts to celebrate: Coles has abandoned plans, at least for the moment, to screw consumers by making them buy plastic bags at the checkout while simultaneously selling more bags to line kitchen tidies and the like. The reversal came, according to news reports, after a “customer backlash”. As the left has long known, the squeaky wheel gets the oil. Apparently that applies to the other side of politics as well. Perhaps we should be angry and loud more often. Still it is only a partial victory, as Quadrant Online discovered on Monday night after an attempt to stock up at the local Coles-run Liquorland outlet, where half a dozen bottles of pinot noir, a likewise quantity of domestic champagne, a bottle of vodka and six-pack of Asahi Dry were piled on the counter to be charged against the Online editor’s credit card. “Do you want bags for all that?” asked the young fellow on the other side of the counter. The counter jockey was adding the bags to the bill when he was told to stop. The young bloke apologised, said it was corporate policy and there was nothing he could do about it even though, as he conceded, the supermarket under the same roof was now giving the bags away with no charge. A call to Coles PR unit established that the kid wasn’t lying: buy meat, fish and vegetables and you can carry them home in a free bag. Buy alcohol and you will be charged for the privilege of boosting Coles’ revenues. Happily, just up the road and around the corner, my neighbourhood boasts a Thirsty Camel franchise run by a very helpful and hard-working Chinese family. They bagged the business — bagged it quite literally — instead of Coles. And here is the bonus: what would have cost in excess of $140 at Coles came to only $127 at Thirsty Camel with as many free single-use carry bags as were needed. Yes, it’s a small victory, but a victory all the same. With state governments pushing gender-neutral pronouns, police charging innocent citizens for protection from thugs and an allegedly conservative government doing all within its power to make electricity both unreliable and unaffordable, let us relish our triumphs where we find them. 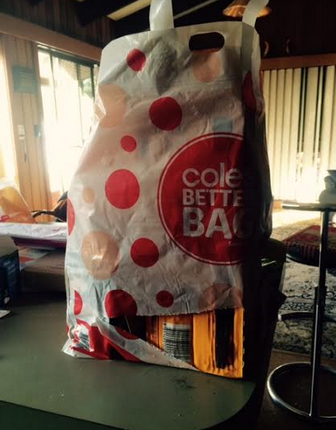 By the way, the picture atop this post is one of Coles’ “re-usable” plastic bags. It made it no more than 50 metres from the checkout before the bottom fell out. To see how confident was Coles in attempting to gouge consumers, follow this link or the one below to read the supermarket chain’s press release from April. Apart from testifying to the implicit belief that a slick, green PR campaign will be enough to shame cowed consumers into doing what they are told, it also serves as a reminder that, when any outfit with a team of paid liars on payroll invokes Gaia’s good health, hang on to your wallet.